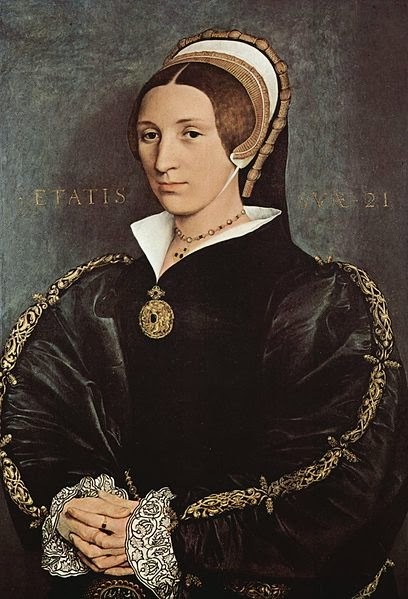 observations: There are no known surviving pictures of Gregory Cromwell, and it’s just a guess that the woman in the picture, by Hans Holbein, is Elizabeth Seymour, who will become his bride. The character notes in the playscript are by Mantel herself, and make particularly fascinating reading for anyone who knows the books well: and here tucked away is a line from the anxiously-awaited third one, and news of Gregory’s fate – which we (discreetly) spoilered in this entry on Bring Up The Bodies, while elsewhere we suggested that Catherine Zeta Jones is born to play the part of Anne Boleyn. I re-read Wolf Hall after seeing the plays, and experienced the same effect as the other times I have read the book and its sequel: for a few days I kept considering things the way Thomas Cromwell might, seeing the world through his eyes. (Which presumably is more like Hilary Mantel’s world…) And, nothing changed my view that the books are the great novelistic achievements of the early 21st century: it is too early to tell about the plays, but they certainly help out while we’re waiting for the next book. Boleyns, Tudors and Mantel all over the blog – click on the labels below. Mantel's Jane Seymour - Lizzie's sister - is here. Moira - Oh, I'm so glad the plays are good. I'm glad to hear that they do some justice to the novels. And what an interesting piece of history Mantel explores in those stories. Just full of so many interesting characters, lots of court intrigue, the politics, the whole thing. Yes, I really enjoy any kind of Tudor history - fiction, non-fiction, plays. But I also think it would be a great way to introduce young people to it, and make them see the fascination of history, and its applications to modern life. Sorry Tracy! I think having read other books does help, but really this is just a great book... one day you will find time. And a female author for your percentages. When I see books like this, I'm reminded of history at school........it's a no from me. Was expecting that, though there IS quite a lot of gruesomeoness in the books in the way of torture and executions, though it's offstage. Moira: A day after telling you I had not read any of your 2013 favourites you post about a book I have read. I found Wolf Hall a good book but would not lavish it with the praise many have given it. I have read the play offers another perspective of Cromwell. I hope I can see it. The painting evokes a sense of restrained richness in the fabric and details of the dress. Thanks Bill. I think the plays are very good, and will have a life of their own, so everyone will get a chance to see them.